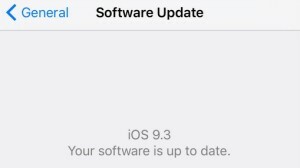 There have been numerous issues associated with the new iOS 9.3 update, as referenced here by GottaBeMobile and TechRadar. For some users, even iPhone 6, the phone requires them to log in with their apple ID but results in an error that says verification failed because it cannot connect to the iCloud server. Furthermore, in iCloud settings all options are greyed out except “sign out” but that results in a similar error. Some users are reporting that the only way around the problem is a restore. Before you decide that your device is “bricked” and you erase and restore, try checking to see if location services is turned off. It can end up in an off state even if it was turned on when you began the update thus resulting in this confusing and frustrating error.